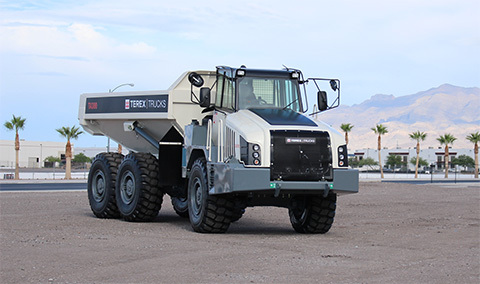 Terex Trucks has updated its TA300 articulated hauler with the introduction of a new and improved transmission. The 28-tonne (30-ton) workhorse will now incorporate the latest EP320 transmission from ZF as standard. This results in a 5% improvement in fuel efficiency, as well as enhanced performance and productivity, when compared to the previous model working in the same application. The new transmission comes with eight forward gears as well as four reverse gears, higher overall gear ratio spread, equal ratio steps between gears and optimized gear shifting with partial load shifts. All of this helps to ensure smoother gear shifting and thereby higher levels of operator comfort. The TA300 is also equipped with true independent front suspension as standard, further enhancing operator comfort and enabling excellent traction control and maximum productivity in the most challenging of conditions. The upgraded TA300 boasts improvements in fuel efficiency, performance, productivity and operator comfort.